Konishi Hirosada (ca 1810 - 1864) Kataoka Gado II as Horiguchi Gentazaemon, 1849. Deluxe Chuban. What a great design this is… the silver printed rain sweeps in from the upper right corner, delightfully pushing the calligraphy into the gloomy, shade background. The subject matter is the same play (A Child’s Revenge), but the actor is playing the opposing role to the previous print described above. This deluxe print, with its silver rain and gold embossed mons is a masterpiece of Osaka printmaking. The charming title of the play - A Child's Revenge - belies the grimness of the story. A true story; it is based on the vendetta carried out by a youth, Tamiya Botaro. Botaro’s father, Tamiya Genpachiro, is a fencing master. His rival Hori Gentazaemon, is so in fear of the superior skills of Botaro’s father that he kills him by subterfuge. The child is orphaned and brought up by the nursemaid in Shido Temple where he was advised by his uncle to behave as if deaf and dumb in order to throw off his enemies. His nurse Otsuji believed he was really mute and prayed with ritual ablutions to the god Konpira in order that he may regain his speech and become skilled at arms in order to avenge his father's killer. In the play, Otsuji went on to commit suicide as an act of sacrifice, dying in the knowledge that Botaro can speak and that his martial skills will enable him to achieve his revenge, even while still a child. 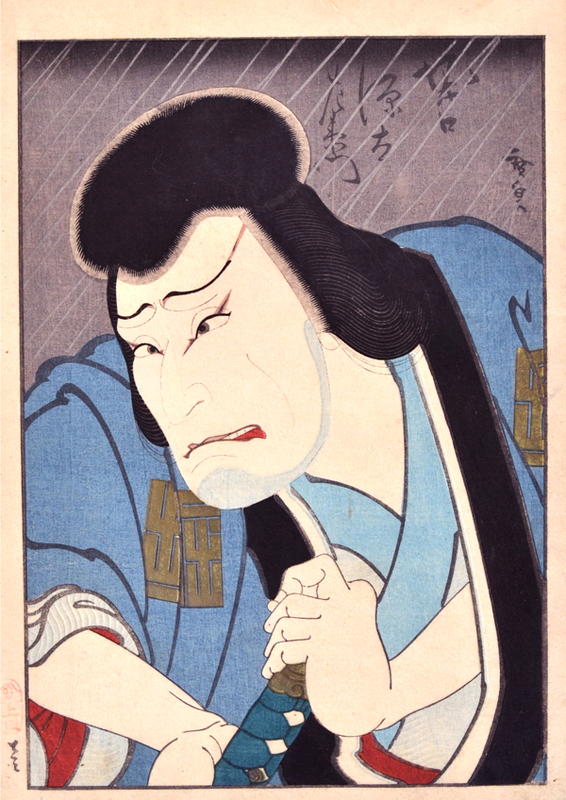 Yoshitoshi made the definitive version of the story, so influential at the time that the kabuki stage was altered in order to accommodate his vision of the scene. He accomplishes his revenge at the age of eighteeen. A beautiful and rich print. Colour, impression and condition are all fine.